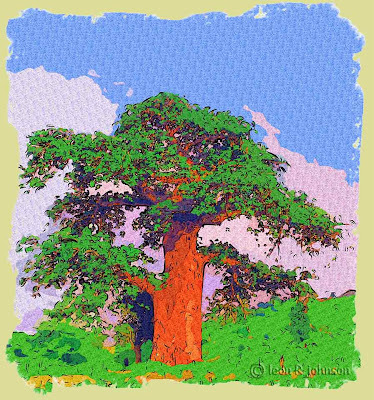 The baobab tree is probably the most famous and the favorite tree of Africa. The old story is that God got angry one time and uprooted a tree and then drove it into the ground upside down. The baobab resulted. The fruit contains a seed covered with a powder that can be used in cooking as tarter. Sucking the seeds as a snack is enjoyable as well as a thirst killer. 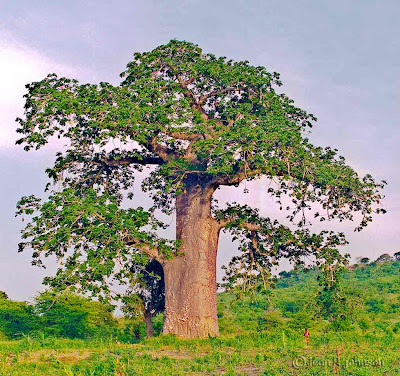 Hollow baobab trees have served as gun emplacements during war time, toilets for travelers, cisterns in dry times, sources of fiber for making clothing, bags, hats and other things. Usually the baobab is seen without its foliage. Here is one near the shore of Pemba Bay in Moçambique dressed in all its splendor.